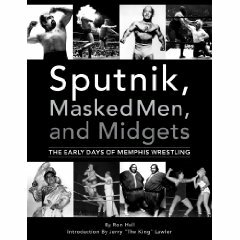 There’s a new book out, Sputnik, Masked Men, and Midgets: The Early Days of Memphis Wrestling. It’s published by Shangri-La Projects, the same folks who put out several great books about Memphis Music. They were nice enough to send me a media copy, so here’s a review. The book opens with a photo gallery of early Memphis wrestling in the 1940s and 1950s. There are pics of Gorgeous George, who revolutionized wrestling during that era playing the role of the cocky, obnoxious heel. Muhammad Ali based his interview style on Gorgeous George. Then there’s Johnny Valentine, also a cocky heel who cheated to win. There’s Farmer Jones, popular with the rural fans because he brought his pig to the ring with him. Perhaps the scariest individual of all, though, was a bald wrestler named The Swedish Angel… just one look from him would be enough to make most people run. Then there’s a chapter on foreigners and fake foreigners. German Nazis, evil Japanese like Tojo Yamamoto (until he turned babyface in the 1970s, he was evil), Russians, Mongolians. Pics of an Italian wrestler named Joe Scarpa who had a mediocre career until he reinvented himself as Chief Jay Strongbow. Next up the book takes a look at Memphis wrestling in the ’60s. Sputnik Monroe was the biggest name during this era, and he was an important figure in Memphis race relations… he refused to perform in Ellis Auditorium until his African-American fans were allowed to sit up front with the whites. There’s a news clipping about him being arrested for disorderly conduct for being in what was then a blacks-only bar on Beale Street. Jackie Fargo and Tojo Yamamoto, the other big names of the ’60s, were featured heavily in this section as well, as was Lou Thesz, the NWA world champion from 1963 to 1966. Next up are chapters on women wrestlers and midget wrestlers, and a section on music recordings made by Memphis wrestlers. The book contains a bonus music CD. Next up are the “brown bombers,” African-American wrestlers who were popular in the ’50s through ’70s. Bobo Brazil is heralded as one of the first black wrestlers to appeal to all races. Sailor Art Thomas was popular in Memphis too. In the early ’70s Sputnik Monroe formed one of the first mixed-race tag teams in wrestling with Norvell Austin. Austin would later form another famous tag team, the PYTs, with Koko Ware. There were also pics of “Soul Man” Rocky Johnson, who was very popular in the ’70s and received many regional and world title shots… he’d go on to further fame as WWF Tag Team champion, and he’s the father of one of the most famous wrestlers of this century, The Rock. The last, and largest chapter, covers Memphis wrestling in the 1970s. When the decade started, the two top names were Jackie Fargo and Jerry Jarrett (father of Jeff Jarrett with whom he co-founded TNA, the major competitor to WWE today). However, not long into the ’70s Memphis wrestling had a new King… Jerry Lawler. There are dozens of photos of Lawler’s matches, as well as news clippings about his memorable feuds. “Superstar” Bill Dundee and Tommy “Wildfire” Rich are also profiled, as is “Handsome” Jimmy Valiant (who didn’t get his “Boogie Woogie Man” nickname until the 1980s). Lawler’s manager Sam Bass, who died in a car wreck in 1976, appears in several photos. The legendary TV announcing team of Lance Russell and Dave Brown is profiled as well. Here’s something for you to hunt for if you own the book: The man who would later put on a mask and become the legendary Mr. Wrestling II is pictured, not as II but rather under his own name in a circa 1970 picture. Can you find him? Definitely a book worth having if you’re into the rich history of Memphis wrestling. Available from Shangri-La Projects, or at various locations around town (I saw it on sale at Valle’s Italian Rebel where I ate lunch today). You can also order it from Amazon .